Brussels sprouts, a member of the cabbage family, are an easy and economical vegetable to grow in the home garden. Each plant can yield up to 3 pounds of sprouts throughout the growing season. Like most vegetables, Brussels sprouts freeze beautifully. The little cabbage-like sprouts grown on the stalk. You might even find them sold on the stalk in the fall, winter, or early spring. If they are on the stalk, they will be fresher, more flavorful, and moister. You can even roast them, stalk and all, and then cut them off to eat or freeze. Using these steps, you can freeze your fresh or frozen Brussels sprouts and enjoy them throughout the year. Choose firm, compact sprouts from 1 to 2 inches in diameter. Look for any signs of insect damage. Trim and discard the root end and any coarse, yellowed, or damaged outer leaves. Wash under cold, running water. If you suspect insects, soak the sprouts for about 1 hour in cold water with 1 tablespoon of salt per gallon. The salt will coax out any insects or worms that might be hiding in the leaves. Blanching time depends on the size of the heads, so sort and separate the sprouts by sizes. Add the sprouts to the boiling water, the larger ones first. Blanch the large sprouts for 5 minutes, the medium sprouts for 4 minutes, and the small sprouts for 3 minutes. You can either cook them in large, medium and small batches or add the medium ones after the large ones have cooked for 1 minute and then add the small ones after 2 minutes have passed. Continue boiling for 3 minutes. Immediately plunge blanched sprouts into the ice water to halt the cooking process and cool completely. Spread the sprouts out in a single layer on a large rimmed baking sheet and pat them dry. Freeze the sprouts for about 1 hour. Transfer the frozen sprouts to freezer bags or containers, and squeeze out as much air as possible. A vacuum sealing system is an excellent investment, especially if you do a lot of freezing. Label the containers or bags with the name and date and freeze the Brussels sprouts for up to 12 months. A pound of fresh trimmed Brussels sprouts will yield about 1 1/2 pints frozen. To cook the frozen sprouts, cover with seasoned water in a saucepan and bring to a boil. Lower the heat, cover, and cook for about 10 to 15 minutes, or until tender. You can also make simmered Brussels sprouts with stewed tomatoes as another way to enjoy the frozen sprouts. Or they can be cooked in a gratin with cream and cheese. Trim and clean the Brussels sprouts following steps 1 and 2, above. 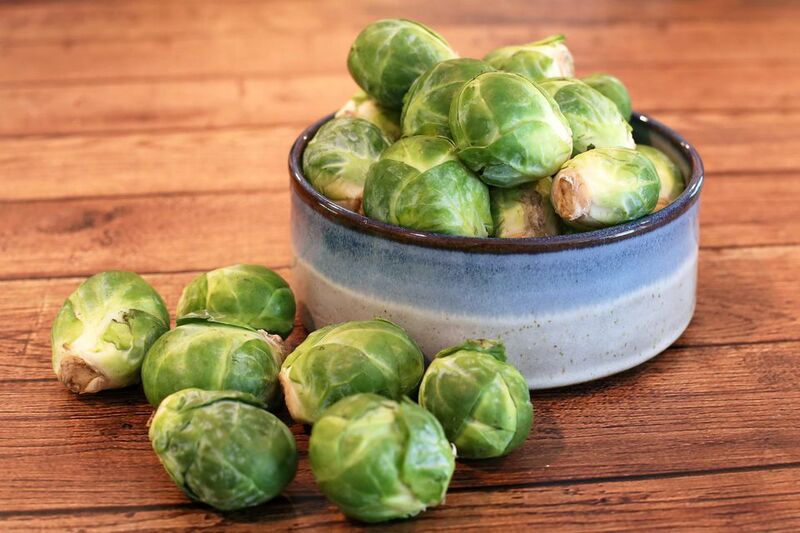 Toss Brussels sprouts with about 2 tablespoons of extra virgin olive oil for each pound of sprouts. Arrange the sprouts in a single layer in a jelly-roll pan or rimmed baking pan. Roast for about 40 minutes, or until tender, shaking the pan frequently to turn the sprouts. Remove to a rack and let the sprouts cool completely. Transfer the cooled sprouts to resealable freezer bags or containers. Label with the name and date; freeze the roasted sprouts for up to 12 months. To cook, saute in a skillet or saute pan in olive oil or butter until tender or heat in the microwave. Toss with 1 tablespoon of lemon juice, if desired.